Learn how to do Digital Painting in Photoshop with world renowned artist Aaron Blaise. Perfect for beginners or seasoned pros! 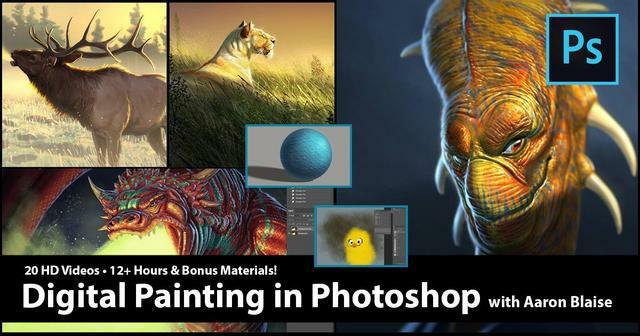 In this in-depth 12.5 Hour video course animator, director and concept artist Aaron Blaise ("Brother Bear", "Aladdin", "The Lion King") takes you through his process of digital painting in Adobe Photoshop. Watch as Aaron creates new original images right in front of you in REAL TIME and explains his process. He ALSO teaches you his method for creating custom photoshop brushes. Using Photographic textures & "photo-bashing"
Aaron has an engaging, entertaining and approachable teaching style that people really love. We believe this is simply the most detailed and comprehensive course on how to draw bears that you will find. Whether you are a beginner or a experienced artist these fun and engaging videos will teach you something new!